Charity rock and hip-hop concert series CLASH is returning Saturday with a concert featuring top hip-hop acts Garion and Insane Deegie to benefit the Butterfly Fund, which helps women across the world affected by wartime sexual violence. The Butterfly Fund was started by Kim Bok-dong and Gil Won-ok, two victims of sexual slavery by the Japanese military during World War II, in coordination with the Korean Council for the Women Drafted into Military Sexual Slavery by Japan. The money from the fund is used to help women who have suffered similar abuses. One recipient has been Rebecca Masika Katsuva, who was raped during the civil war in the Democratic Republic of Congo in 1998. The next year, Katsuva established the Listening House to take care of thousands of women who have gone through similar experiences, orphans and children born of forced pregnancy. CLASH organizer Emma Kalka said that combating sexual violence was one of the causes she was keenest to advocate for. “They not only try to advocate for the comfort women in Korea, and try to get their story out there and the Japanese government to admit what they did, but they are also actively working to help other women all over the world who have gone through the same thing and give them the opportunities and help that they didn’t really get,” she said of the Butterfly Fund. 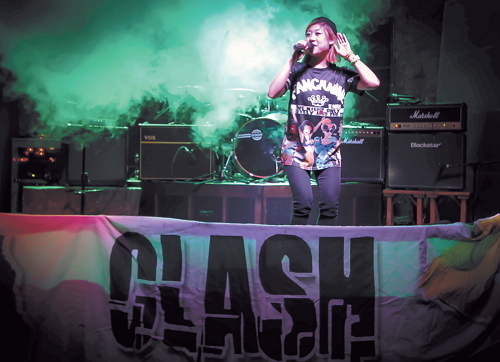 The concept of the CLASH concert series, now on its 10th edition, is to bring together Korean and expat acts in hip-hop and indie circlesfor charity concerts supporting a different charity each quarter. Other causes are the Korean Unwed Mothers and Families Association, Justice for North Korea and the Angel House disabled center. The main acts of this show will be Insane Deegie and Garion, both top Korean hip-hop acts. Kalka said Insane Deegie had been very supportive of CLASH events in the past and she was pleased to see him return, while Garion was an act that she had always wanted to get involved. “I’m really excited that Garion is involved. They are a great performing duo. They are really well known and highly respected, so I knew that would help bring in people who have never been before,” she said, adding that she hoped their pedigree would also attract top acts to future shows. Other acts include expat hip-hop group Part Time Cooks, Jin Jun-wang, bands 24Hours and Stun Grenade. Opening performances will come from Soul-Jay and Mandip from M.O.B. and freestyler Benny Fax. Entertainer Jesse Day will be hosting the event and DJ IT from Brand New Music will be playing music between acts. The concert will be at Freebird 2 in Hongdae. Doors open at 7:30 p.m. and the show will start at 8 p.m. Tickets are 10,000 won, available at the door.